Did you make any New Year’s resolutions? 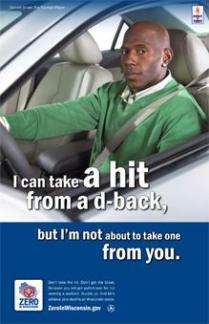 Start wearing a seat belt? Lose weight? Quit smoking? Stop drinking? That decision might just possibly have been the result of SOCIAL MARKETING. Social marketing is an effort to affect a behavioral change instead of to sell a product (check out Donald Driver, a regular wearer of seat belts). You might use social media to help effect that change. In fact, FitBit and other exercise programs can be very effective because people are sharing their experience with others using online/social channels and making use of the spirit of competition to help motivate everyone to meet their goals. So, what is social marketing and how is it different from social media? Social media: is just one of a wide range of tools and tactics that can be used to help support a social marketing effort. Twitter, Facebook, LinkedIn, YouTube, Pinterest are just some of the social media channels available. Many public health efforts use social marketing to help effect changes – such as cancer screenings, smoking cessation, food safety, nutrition and more. Through research, we get at the heart of both what motivates as well as what barriers exist in affecting behavioral change among our target audience. We then craft the messaging and the method in which those messages will be delivered based on the audience. Social marketing is measured in years, not months. Staples Marketing specializes in social marketing – we help reduce the number of deaths on Wisconsin roadways and increase the number of people recycling or using public transit. If you’re still confused about the difference between social marketing and social media – let us know. We’ll be glad to help clarify. ← BRACKET? I HARDLY KNOW IT!